Born in Brescia in 1971, Francesco Vezzoli is considered to be amongst the most interesting contemporary Italian artists to emerge recently. In his work Vezzoli uses a wide variety of media, including painting, embroidery & video. He was chosen to represent Italy at the Venice Biennale in 2005 and in 2007 where his works received high acclaim. Vezzoli’s work is also present in major institutions including the Tate Modern, London, the François Pinault collection, Paris – the Fondazione Prada, Milan, the Museo d’Arte Contemporanea del Castello di Rivoli, Turin, the Solomon R. Guggenheim Museum; New York and the Whitney Museum, New York; moreover major exhibitions have been devoted to him at the Maxxi, Roma in 2013 and the Moca, Los Angeles in 2014. Vezzoli’s artistic language demonstrates a wide variety of influences: for example taking from Ancient Rome for his famous parody entitled Trailer for a remake of Gore Vidal’s Caligula – as well as referencing 20th century Masters such as De Chirico, Picasso and Albers, whilst also encompassing artistic quotes from the Neoclassical age to 1920’s movies with a particular predilection for those of Marlene Dietrich. 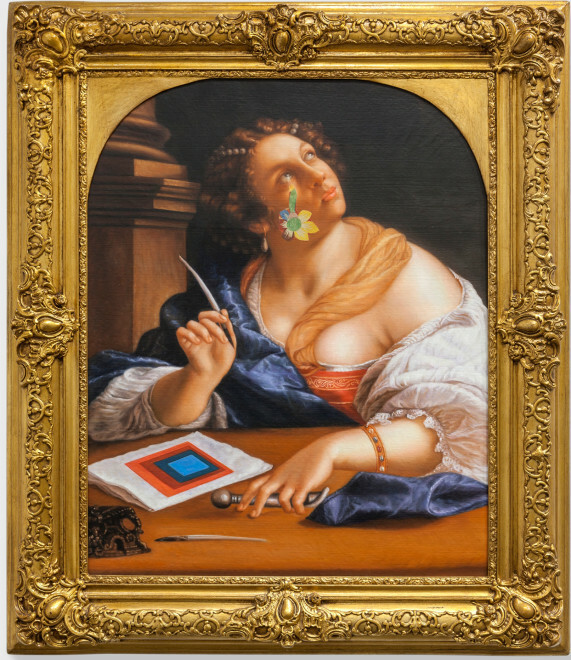 In the present work Francesco Vezzoli uses as his subject matter, a painting attributed to Artemisia Gentileschi that Vezzoli probably saw at the great exhibition held in Milan and Paris in 2012 (Artemisia Gentileschi-Storia di una passione). Artemisia’s painting becomes for Vezzoli a vehicle on which he builds and demonstrates his talent in manipulating famous images and for unifying totemic elements of his disparate artistic interests: in this case a flower, inspired by the work of Natalia Goncharova, is applied on the figure’s face and on the sheet of paper on the table, a Josef Albers painting is reproduced. The pairing of the Goncharova flower with the Gentileschi work is perhaps alluding to the radical nature of both artists who due to their gender, were obliged to fight against prevailing attitudes to establish themselves artistically, and the Albers may also allude to the “Allegory of Rhetoric” since his works are poetic essays in colour combination and invariably have detailed inscriptions on the verso explaining their rationale and construction.